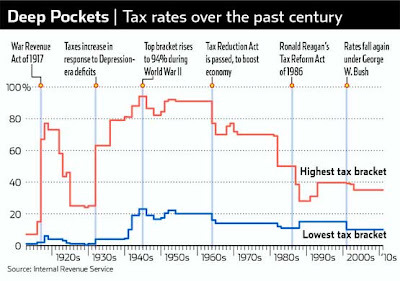 These two graphs paint very different pictures of the history of our federal tax system. The first graph, which shows STATUTORY MARGINAL income tax rates, looks like a roller coaster. It comes from the Wall Street Journal, where it accompanies a fascinating article, Soaking the Wealthy: An American Tradition, written by tax historian Joseph Thorndike. 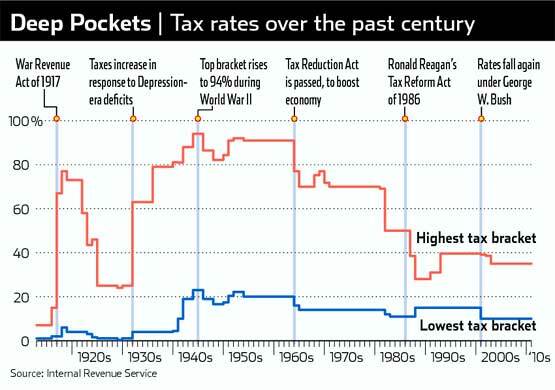 The article gives a great bird's eye view of how the progressivity embedded in our country's tax system has changed over time. 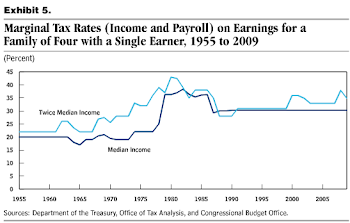 The second graph, with a green line that shows EFFECTIVE AVERAGE federal tax rates, looks far smoother over the past six decades. It comes from Jon Gruber's Public Finance & Public Policy 3rd edition, the textbook I use in my fall term public finance class. What is going on? Why is there such a disconnect between the two graphs? 1) When statutory marginal rates were high, there were far more "loopholes" available and also far more incentive for taxpayer to take advantage of those loopholes. This is most true for the highest income taxpayers, who have the means, motive, and opportunity to seek out the best possible tax treatment for their income. The latest IRS statistics of income study showed that the wealthiest 400 taxpayers in the country were paying less than 17% in effective average tax rates in 2007, which is less than the average American paid that year. Even some taxpayers eligible for VITA services paid a higher percentage of their income in federal taxes than 17% that year. Disclaimer: Any opinions, commentary or annotations on this site represent the personal opinion of the site's author and not the IRS, Union College, or any other entity. Any hypothetical tax scenarios discussed on this site are illustrative discussions for the purpose of preliminary volunteer training and/or policy analysis, and do not constitute tax advice. The tax code is so complex that a completely accurate answer about your particular situation requires a complete consultation. If your tax situation falls within the scope of our site's IRS VITA certification, you are welcome to make an appointment for comprehensive tax help at our VITA site after we open in the third week of January, where we will conduct a full interview and intake and quality review process to take into account all relevant circumstances of your particular tax situation.